Those of you who follow me on Twitter will already know that I have been smearing my face in honey for the past couple of nights in order to heal some acne and scarring which will help with Project: Clear Skin! Honey has natural antiseptic properties and includes a variety of minerals and vitamins. 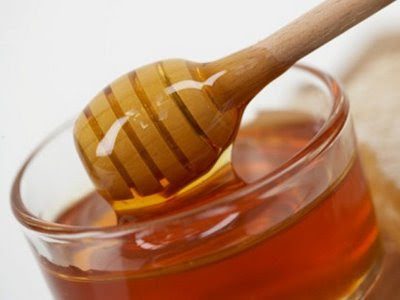 By applying honey to a wound, it helps prevent infection. Many types of bacteria can't survive in honey so wounds heal, swelling eases enabling the tissue to grow back. Therefore accelerating the process of skin healing. I really don't know why I didn't try this sooner, my skin is already clearing up and feeling much better, no wonder why most companies incorporate honey into their products. I really wanted to do this post as I believe I will see even better results if I continue to do it, I really want to help people suffering with acne as I know how depressing it an be. I dismissed the idea of it in the past as I was under the misconception that nothing works. I was wrong. When honey comes in contact with body moisture, it releases antiseptic hydrogen peroxide to fight bacteria, it also draws body fluids and nutrients to the area thus assisting with cell growth. I have read that the antibacterial properties increase twofold when diluted with water, newly born bee's are nourished with diluted honey so they can build a stronger defence mechanism by the older bee's as they know this feature. How clever is that? Read the full article of this fact! There are countless benefits of honey, this acne treatment is just one of them. Do your own research too! I have been doing this just before bedtime, suitable for sensitive skin and can be used daily. - Apply pure honey all over your face or on the selected area. You will feel a slight stinging sensation, this means that the antiseptic properties are kicking in! For twice the benefit you may pat some water over the honey whilst on your skin. - Wait approximately 15 minutes, during this process you will see that there will be tiny minute bubbles on your skin, this is where the antiseptic hydrogen peroxide has attacked the bacteria and has pulled up nutrients and body fluids to help aid cell growth. - Rinse with warm water, pat dry.... you may tone your skin to close the pores in your desired way and then moisturise. I am definitely going to try that. Have had a face disaster this week (post coming soon) and it sounds like this would really help. Thank you for this! I think I'm going to be trying this, my skin needs a massive help! Fantastic tip. I will have to look into this. Thank you! Woe that's really interesting!Great post!It's really good to see natural remedies that work wonders on your skin. I've tried this before, it works really well! My grandma constantly told me to use honey when I was a teenager but I never listened.. I wish I did now. I do this all the time as the honey draws out blackheads and underskin lurking spots. Great post.. more people should try nature's way of fighting skin issues!! I also use honey on my excema (cant spell!!) It cleanses it and calms it down as well as fighting the rash! AND.. (yes i have more to say bare with me) if i cut myself i mix honey and water and put it on the wound or burn as it is an anitseptic and prevents infections forming! wow that's so amazing! i will definitely try it! do you use it everyday? I found out about honey from an asian beauty book I have, I can remember making a 'serum' from cucumber juice,honey and rosewater and putting it on at night, and it really did wonders! so there u go! I'm convinced that natural is most often the way to go! Keep us updated on all the new things u find out honey! Awesome! Thanks for the tip, I will try this as I just had another nasty breakout (I think I'm allergic to sunscreen...seriously). Does the honey have to be organic? Really cool to know! My skin has started to break out a bit and I'm in definite need of some good skincare! Ooo and you can def see a difference? I'm gonna try this on the little £$%^&* thats decided to appear on my chin!! Thanks for sharing! I'll definitely do this. My skin is acting up again. I'm very excited to see the results! Will try this when I get home. THX! This looks great. I'm going to have to try that. Who knew honey could do that? yay.. so glad you are liking the honey!!!!!! Wow!! Thanks for the info. I'm going have to try it!!! And Thanks Tali, didnt know it helps with blackhead too!! Ooo.. Thanks, for sharing.. Never heard of doing this before. I'll try it soon. Hmmm. I typically have very nice skin but this semester has caused a lot of stress bumps (I guess better than mumps). I work with a physician who has a bee farm. I wonder if that stuff he gives me in a jar will work. I am so terrified of using it, but I guess it is more organic than Oil of Olay? I suffer from breakouts constantly and i feel like I've tried everything but i will try the honey mask-thanks for the great post! I had tried this,its really nice and works perfectly. I have to try this!! My skin's in pretty bad shape, and I've been trying to clear it up for a while now. Hopefully this will help speed it along. Thank you so much for sharing! OMG!... I'm so glad to hear there is finally a way to get rid of my pizza face! I've tried everything else! Amazing! I'll be sure to try it out! thanks for sharing! I just want to say that I have tried this 2 nights in a row, and has worked amazing so far. I broke out after using sunscreen and now my face looks way better. Thank you so much for sharing this with us! I just wanted to ask you if you can see the results immediately after removing the honey layer or maybe the day after. And also, how do you remove the honey from your face, just plain cold water? Thanks a lot for posting this, I find it really helpful as I am definitely going to try everything. I have a lot of scars at the moment, and redness as well, that is the story of my life. Thanks for all of your comments and suggestions... i really suggest you try it if u have redness or pimples on your skin, it's worth a try! It doesnt have to be organic honey, currently im using rowse pure honey. it takes a couple of uses to see the difference but u can feel the difference immediately. Was wondering, do you think it has helped with scarring at all? I just did a honey mask yesterday, But I didn't leave it on for 15mins! I love honey, it's actually an exfoliant too, which is so good as my skin flakes at even the most gentle exfoliants.